This past weekend, I was juggling thoughts of what I need to start hauling back and forth between the two kitchens, the one in Lyon and the one in the Alps. We got in the habit of loading up the car with lots of stuff when we were first going up there, and it stuck. I dream of one day just saying: lets go! and getting in the car and going, without worrying about packing anything. A day when we don't have to make lists and carefully ensure that everything is there before we leave. So far, the hauling things back and forth has worked alright, although we did forget to pack the keys to the house once! There are so many essential things that we can't get doubles of right now. The kitchen scale, real knives, certain cookbooks I look to for inspiration, the pressure cooker (which comes in very handy on the wood stove), and the blender. I had this bunch of lemons and wanted to bake a lemon tarte, but I didn't have the blender for the one I like to normally do. So I just made up a new recipe loosely based on the one I had done a million times already, a mechanically simpler one that makes use of no implement more sophisticated than a hand whisk. The pay off was incredible when compared to the effort that went into it. Oh man. This one is dangerous. An Even Easier Tarte au Citron, la recette. Begin with your favorite short crust. I used this base recipe, substituting cold water for the creme fraiche for no other reason than I didn't have any, and adding a tablespoon of sugar that I'd kept in a jar with a vanilla bean to the mix, because, you know, it was going to be a lemon tarte. Roll out the crust, cradle it into a small tarte pan (I would say no bigger than 8 inches), or any receptacle that you can imagine holding a tarte, pierce it in regular intervals with a fork to keep it from puffing up as it cooks, and pre-bake it in a moderate oven (350F/180C) until it is firm to the touch and lightly brown around the edges. - Wash the lemons, and cut the zest off of one fruit, just the very thin outer yellow part, and sliver it into a very fine mince. Set the zest aside. - Squeeze both lemons and set the juice aside. 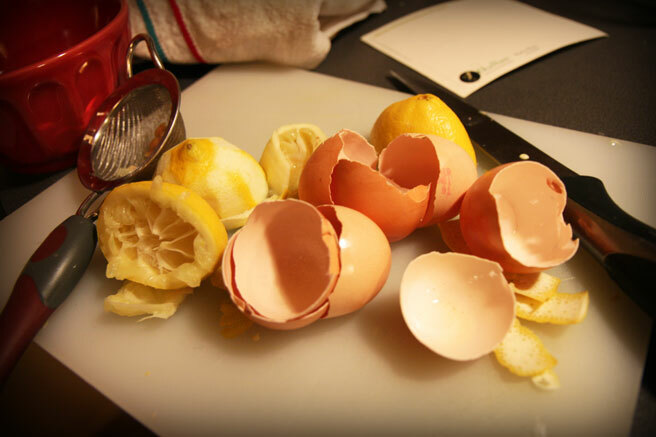 - With a wire whisk, beat the egg yolks and sugar until it lightens in color. This is easily done by hand in about 4 minutes. - Add the lemon juice, whisk again until it is fully incorporated, and add the minced zest. - When you pull it out of the oven it will still be a little jiggly, but it will take its lovely firmish curd like texture as it cools. Let it cool completely before serving. Note: I probably could have topped this one with meringue but it was raining slush out and I didn't want to push my luck. oooh! - lemon tart - my favourite. My daughter is a big fan of yours and she will love making this for me (and for herself). Thanks. Yum, I had one of these made for me a week ago for my birthday, I got the frenchie to make it for me! try it with a half whole wheat/white crust..it works out well. 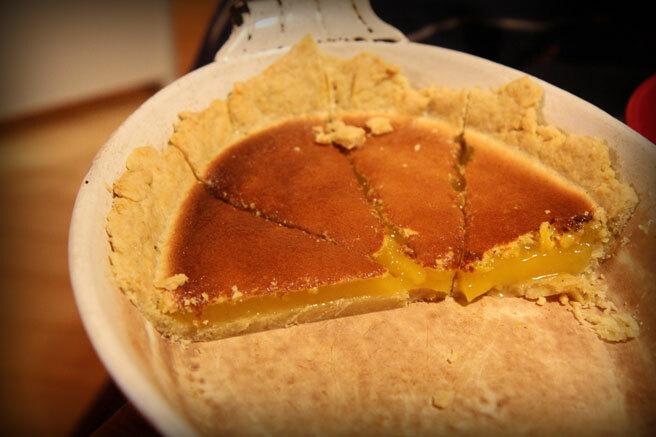 We'll try your crust recipe out next time...now there is a reason to have another lemon tarte! My Meyer lemons have been waiting for me to stumble upon your recipe. This is what I will make tomorrow. Your photos here are beautiful. Okay, I salivated over this tarte citron recipe and gave it a shot last week. It tasted DELICIEUX--but it was flat as a pancake. Any thoughts? Hello Jane, The best way to make a thicker tarte would be to use a smaller tarte shell.